I thought I might make memory books or scrapbooks of my son's childhood someday, but before my husband died it was not something I had done. Several of my aunts enjoyed this hobby, so after John died they invited me to join them for weekly scrapbooking gatherings. During the years since John died, I have discovered that self-expression is an important part of the healing journey. My initial reason to make memory books was to keep the stories alive for me. I began by making a book of John and my life together. I worked on it many months. When I was getting near completion of the book, my aunts and I went to a cabin for the weekend to "scrap." My goal was to finish the book. I can't explain it, but somehow after I had finished that book, I felt like I had made a significant step forward on the grief journey. Now I'm learning why. Find out in this article-- The Management of Grief. Read more about this memory book that chronicled our life together. Next because my son was only 18 months when his dad died, I wanted him to know his dad. So I decided to make books that he would have as he grows older. This memories scrapbook covers his dad's whole life story. You can gather stories and memories of other family members by creating an online memorial or tribute page. In the tributes to deceased loved ones section of this site, you can create a simple tribute page. Send the link by email to your family and friends asking them to type a favorite memory in the comment space. You would have a collection of all these stories in one location. Copy and paste them to print. Because my son was so young, I was also looking for ways to tell him the story of his dad's death. I used the style of a preschool picture book to tell him this story. The picture book link also includes some ideas to use to make memory books with older children who are grieving the loss of loved ones. I find that symbolism and metaphor help to give a fuller picture of an experience. In this memory book idea, I give suggestions for using a tree as a metaphor for your loved one's life. I discovered a very moving book that someone created in Blurb in honor of his deceased mother. It is a photographic essay book that includes photos from the author's mother's house shortly after she died. These images of those empty spaces where his mother used to be create a powerful expression of the author's loss and hint at who his mother was as a person. Click here to see the book and ideas to make memory books of similar theme. If you have looked over these different ideas about making memory books and would like some guidance on getting started on one of your own, read Starting a Memory Book. Digital Scrapbooks is a page where I write about my favorite two online options for making digital memory books. Update: After years of using the above options, I'm now convinced that My Memories Suite is one of the best digital scrapbook options available. Read my My Memories Suite Review and see if you think it is right for you. While I still make memory books of my son's life growing up, my main focus in scrapbooking these days has become more like jounaling. My early scrapbooks were to remember events and people. They told stories of what actually happened. Now my scrapbook journals are more like my private musings about those events. A collection of my photos and musings from my grief journey is now being published as a bereavement gift. Scrapbook Journaling Reflection Questions is a list of question prompts that you can use for journaling about a photo or event from your life. Here is a grief journal scrapbook exercise that I came up with for reflecting on a whole period of my life that was behind me because of the death of my husband. Rather than trying to grief the whole situation, I found a few stories that could help me focus on what was most and least life-giving to me about that period of my life. Use this Stages of Grief Scrapbook Journal exercise to reflect on your own personal journey through various stages of grief. There are several models for the grief stages, yet your own journey will probably not reflect any one of those models perfectly. This activity will help you look at your own story in various places with grief and reflect on it. 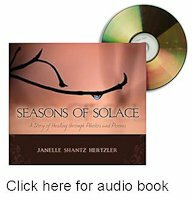 The ultimate outcome of my grief journaling was the book Seasons of Solace. You can find out more about it by clicking the link below.